When you pick fynbos sustainably, you not only protect the fynbos kingdom for future generations, you also protect the jobs of those who live by harvesting it sustainably. For some species, it’s already too late, with 22 known plant species now extinct in the Western Cape, most of these in the fynbos. On the Agulhas Plain in South Africa, where Flower Valley Conservation Trust is based, hundreds more are on the Red Data list. That’s why the Sustainable Harvesting Programme exists, a toolkit of sustainable practices in the fynbos industry, supporting those who pick fynbos for markets. If we can help manage the land properly and address invasive alien plants, we can prevent further extinctions. If we can help create ethical markets for fynbos bouquets, we can ensure land users don’t convert fynbos fields for more profitable agricultural activities. Given that fynbos harvesting offers the largest single livelihood opportunity on the Agulhas Plain, we can then help create jobs. The South African government has lent vital support to the conservation of the Cape Floristic Region, through the creation of the Cape Action for People and the Environment (C.A.P.E.). The Agulhas Biodiversity Initiative (ABI) was launched in 2003 alongside C.A.P.E., both of which Flower Valley Conservation Trust partnered. Through funds granted to ABI by the Global Environment Facility (through the United Nations Development Programme), Flower Valley’s mandate for the next eight years was set. This was to test the hypothesis that the sustainable economic, social and ecological harvesting of wild fynbos is a viable land-use on the Agulhas Plain.. So started Flower Valley’s first steps into the technical understanding of sustainable fynbos harvesting. Today models exist (although they are always being improved with the help of the industry) for this harvesting of wild fynbos flowers. Working with fellow sustainable suppliers, land users, private businesses and local communities, we test how biodiversity, if managed and harvested sustainably, provides economic benefits in the long run. The programme is based on a three-dimensional approach: we balance conservation, social development and economic empowerment in the wild fynbos sector. The Code of Best Practice for sustainable harvesting was developed through a stakeholder consultation process that included input from landowners, pickers, botanical experts, agriculture, Flower Valley, CapeNature and SANParks. It offers fynbos harvesting techniques, waste management guidelines and capacity building opportunities, among other aspects. A Code of Best Practice for pack sheds has also now been developed. 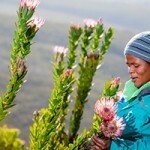 A checklist has been developed to help fynbos pickers assess whether they’re complying with the Code of Best Practice. With the help of well-known botanists, a vulnerability index was developed to assist in determining which fynbos species can be picked, and which are a no go. Most species that are harvested are common and widespread. The index is updated and improved from time to time, as further research helps us to better assess the status of fynbos species. Resource-based assessments help land users to know what fynbos plants grow on their lands, which of those can be picked, and how much can be picked sustainably. 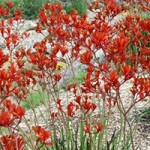 It’s an effective and reliable way of calculating fynbos resources on properties. As part of the Sustainable Harvesting Programme, an online database was developed. This database records information collected at those pack sheds that belong to the programme. It helps the industry to assess the species and quantities coming into the shed, and therefore provides a red flag if lands are over-harvested. The Sustainable Harvesting Programme supports fynbos pickers through a farm management plan. It guides farm-scale planning, and boosts effective resource and environmental management, while improving the management of resources. It’s a great tool for land users to set out their long-term vision for their land, and for their resources.